So you may be asking, what the heck is a “tincture” anyway? A tincture is basically just herbs that have soaked in a solvent that draws out all the powerful medicine within the herb. It is highly concentrated so a small dose goes a very long way. The best solvent is alcohol. Alcohol extracts more of the herbal medicine; and, the amount of alcohol consumed is very small–only about 1-2 teaspoons/day. For young children or those sensitive to alcohol you can use apple cider vinegar or food grade vegetable glycerin–the won’t be as strong but they will still work and you can avoid any alcohol consumption. Vegetable glycerin has the advantage of being very sweet which makes children much more compliant with your offering. Echinacea is well researched and known for its immune enhancing properties. It is very effective in protecting against viruses, bacteria, and even fungal infections. All this while having few side effects and being gentle enough for children. However, there are people that are allergic to Echinacea; so, use caution the first time this remedy is tried. If you try and have any signs of allergy–discontinue use. And while Enchinacea is very safe; I am not a doctor and each person’s health history is unique. One should always discuss with a health care provider before starting a new supplement. 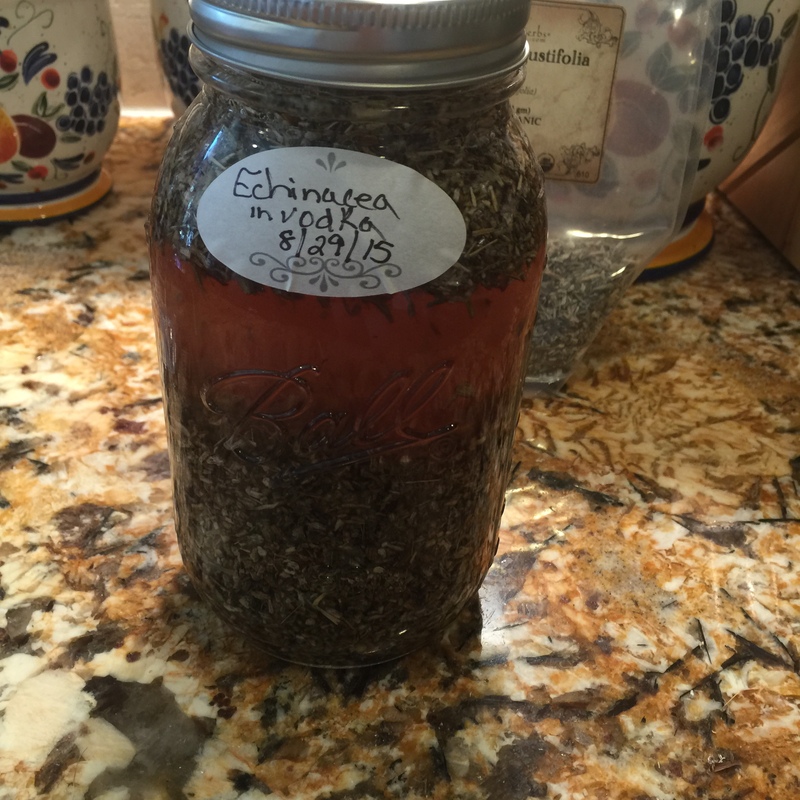 If you would like to purchase my Echinacea Tincture, please click here. Solvent–either alcohol, apple cider vinegar, or vegetable glycerin. If choosing alcohol you will need a choice that is at least 80-100 proof because any less will not be strong enough to extract the medicine. Vodka, gin, rum, and brandies usually fit this bill. Remember though that flavored alcohols will flavor your tincture as well. You may like this or not. 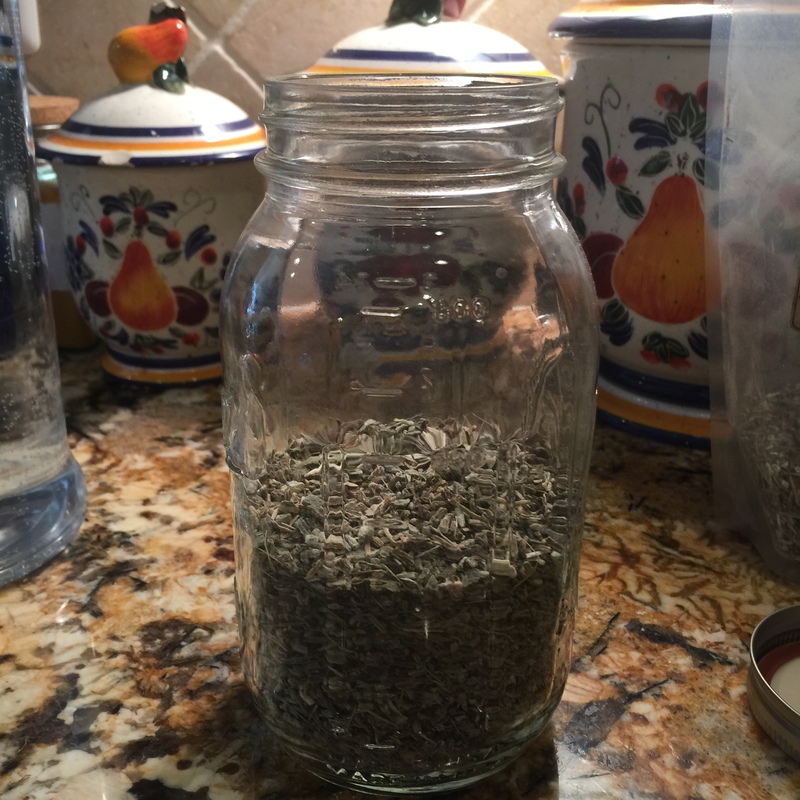 Dried or fresh Echinacea– I prefer to make a “whole plant tincture.” I grow my Echinacea and harvest the leaves, flowers, and roots throughout the season dependent on when each has the plant’s “energy.” For example, during the early spring the plant’s energy is found in leaf production–a wonderful time to harvest for medicine. Summer is when the flowers are blooming and full of strength. In fall, the energy returns to the roots in preparation for winter. My tincture macerates (soaks) over spring/summer/fall leaving me with an incredibly powerful medicine by winters start. I will be posting soon on how to make this powerful version; but, if you aren’t growing your own–no worries! 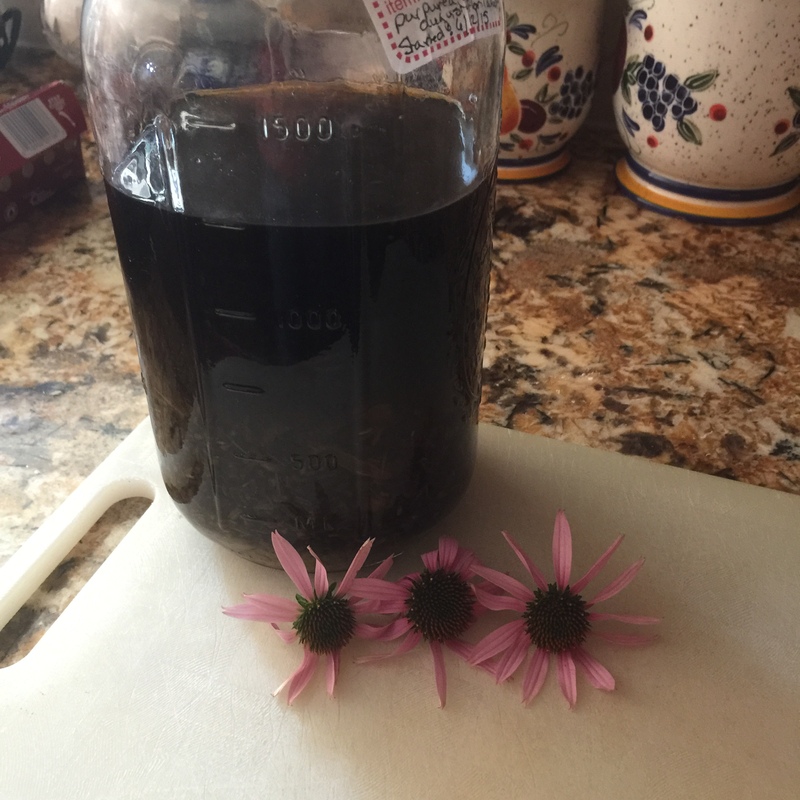 You can make an Echinacea Root tincture which is still very strong and effective. 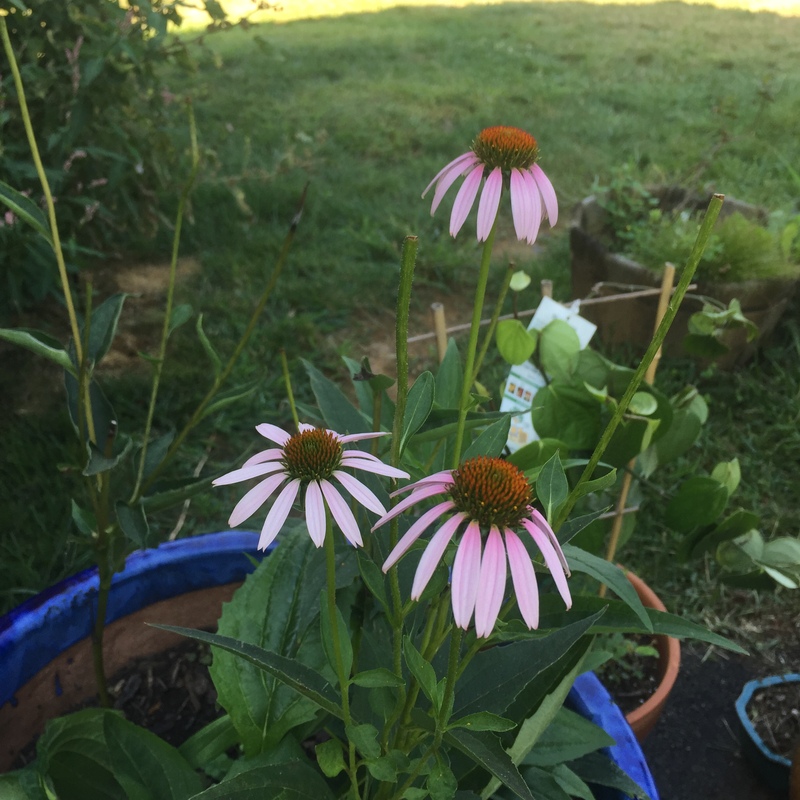 Mountain Rose Herbs carries Echinacea Root. 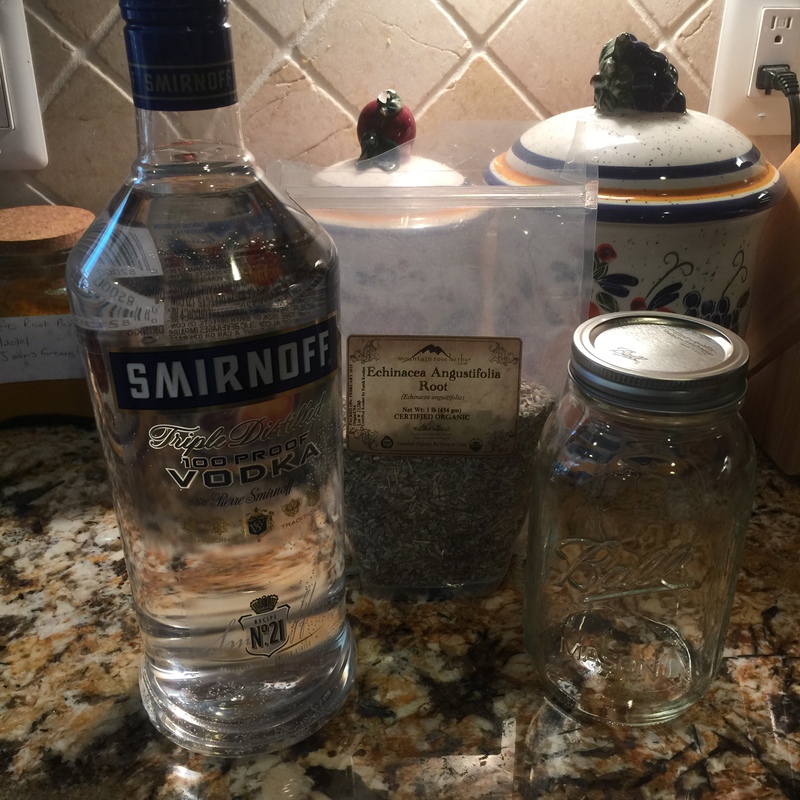 For one quart jar you will need about 8 oz of dried root. I strongly recommend purchasing Echinacea Angustifolia as this is the strongest medicinal variety. It is a bit challenging to grow in the garden so I encourage Echinacea Purpurea as another fantastic choice. It is strong medicine, easy to grow, and beautiful as well. But I digress. . . Fill the jar to the top with alcohol or apple cider vinegar. If using vegetable glycerin–mix one cup of glycerin with one cup of water and fill jar to top. If you need more keep mixing at a 1:1 ratio until full. If using vinegar you should gently warm it first. The warming helps it release the medicinal components better. For all solvents the roots should be covered by 2-3 inches of solvent. Shake vigorously. Label jar with “Echinacea tincture,” the solvent you used and the date you made it. Nothing is worse than having a tincture finished only to forget what you made! Check in every day or so the first week. The herbs might float to the top–this is normal. They will settle over the first couple days. But they also absorb a lot of solvent and expand–this is especially true for roots. You want to make sure and keep the level of solvent 2-3 inches above the plant material. Top off with more alcohol/vinegar/vegetable glycerin mix if needed. Place jar in a warm, dark spot where you will see it and remember to give your medicine some attention. 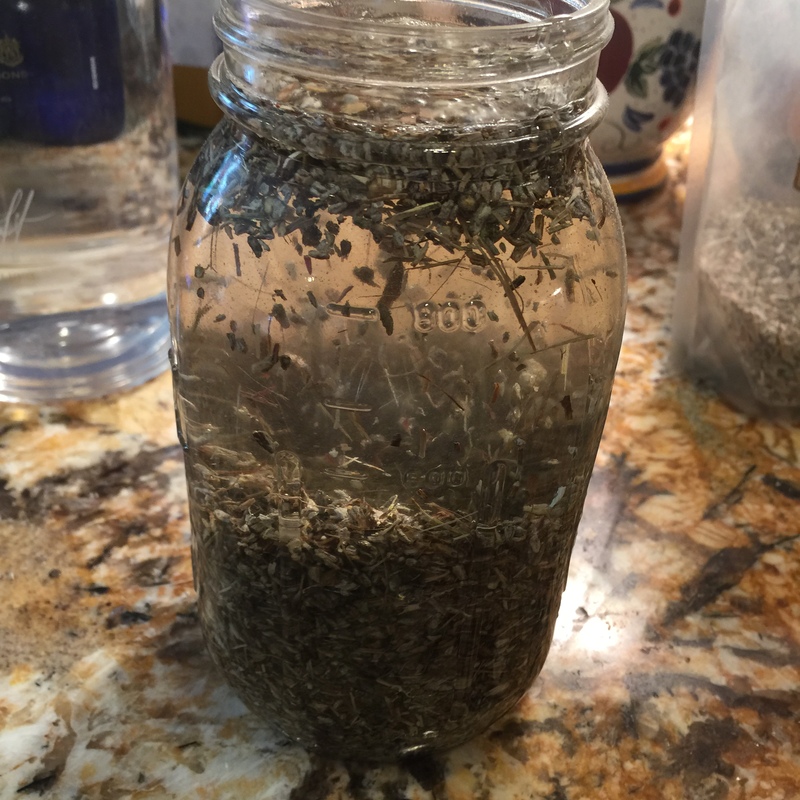 Every day for 4-6 weeks (the longer it macerates the stronger the medicine) you will want to shake the jar to move the roots throughout the solvent and assist extraction. This is actually very therapeutic, fun, and “magical.” If you forget for a few days though don’t worry–you won’t ruin it. Just give a good shake and try to come back more frequently. The pic below was taken just a few minutes after the first “shaking.” Notice how much the color has already changed. This is a very good sign that the solvent is extracting powerful medicine. After 4-6 weeks, strain the mix through cheesecloth into a clean jar with a tight fitting lid. The darker the liquid the stronger the medicine. Usually for a quart you will end up with a half quart of useable tincture. The plant remains are great for compost! This picture is of my whole plant tincture. It is so dark you can’t see through it. While not “appetizing” in appearance. . .”ahem”. . .it does mean this medicine will protect us well and keep us healthy when the germs are flying. Store in a cool dark place and use as needed. Alcohol tinctures will last for years, vegetable glycerin for 2-3 years, and vinegar for about one year–sometimes longer. A lot depends on how they are stored. Direct sunlight or heat will significantly reduce life span. Echinacea is best used in frequent but short term dosing. Its purpose is to “jump charge” the immune system at the first signs of illness. Taking it for long term use isn’t that effective and may even be counter productive. The best way is to take 1/2 teaspoon (2 1/2 dropperfuls) every hour for one day. If you aren’t feeling enough benefit you can increase to 1/2 teaspoon every half hour during this first day. Decrease the dosage either by time or amount over the next couple of days as you return to wellness. You can simply squirt into your mouth but I don’t recommend this. Echinacea tends to produce a tingling on the tongue that isn’t enjoyed by all and is strong tasting. I prefer to mix with a small amount of water, tea, or juice. Here’s to a healthy and joyful winter season! Statements in this article have not been evaluated by the Food and Drug Association. This product is not intended to diagnose, treat, cure, or prevent disease. Information in this article is intended for educational purposes only. ← Free High Quality Frankincense!!! Bless your heart. Impressive that you go to such lengths. I just use Gaia’s echinacea. The company knows echinacea like no other. I’ve spoken with the herbalist there. There are different types and they have formulations for onset and then for prevention. Feel free to email me your latest personal post if you’d like. Holistic Wayfarer (one word) at gmail. You give me way too much credit.. .though it’s appreciated. 🙂 It isn’t really that much trouble to make the tincture myself. I feel energized being out in my garden walking through herbs/flowers. It may sound nutty but I “drink in” their energy. Echinacea is shockingly easy to grow–plus it’s beautiful–so that isn’t hard. And there is something “magical” about knowing exactly what you are using, knowing for certain it is organically grown, seeing the leaves/flowers/roots reach their summit of medicinal value and harvesting at just that moment. I just feel good having medicine that has been infused with my love as well as the natural healing power of the plant. Then it’s basically just “shake and wait.” lol!! Thank you so much for being interested in my personal post. I want to make some revisions but I’ll send it to you later today. Can’t wait to hear your thoughts. 🙂 Heading over to that post of yours now. . it is awesome to meet a like minded lady!!!! We actually do drink in nature’s energy. I’ve been meaning to do a very important post on this for over a year (can you tell I’m just a little busy?) and a few readers have asked for it so I’ll try to get it out in the next few months. I will get to your article when I can. Hit an unexpected speed bump in this journey we call life – have to deal with that first. Just love your description of the relationship you CULtivAte with your garden.